Colorado FireBreak designs and builds customized systems to deliver an advanced hydro gel technology called FireIce in the event of a wildfire. We engineer and install fully-automated wildfire mitigation systems that become operational when sensors detect the UV wavelengths unique to fires. Colorado FireBreak also sells the FireIce Home Defense Unit. In combination, these options create a customized firebreak for your home, outbuildings, and the surrounding trees and property. You decide the level of protection you desire. 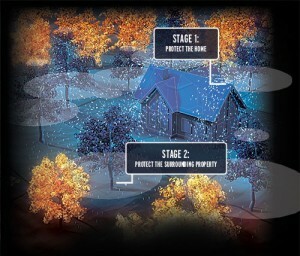 For most homes, Colorado FireBreak recommends our mid-range wildfire protection system, designed to protect your home and an area 50-feet around it. It includes wildfire detection sensors that wirelessly signal the control panel to activate Stage One. In Stage One, FireIce® powder is combined with water pumped from an underground storage tank. This creates the FireIce protective gel, a revolutionary hydro gel technology used by many professional firefighting organizations to stop fires fast. Multiple fire suppression lines installed on the home deliver the FireIce gel so that it covers the home. As the fire nears, the control panel activates Stage Two. In Stage Two, fire suppression lines in the tree canopy at the perimeter of the home spray FireIce on all trees. The microclimate that Stage Two creates lowers temperatures and raises humidity, producing a natural firebreak around the home. Because Stage Two applies water to the area 50-100 feet around the home, it can protect valuable vehicles, outbuildings and trees. 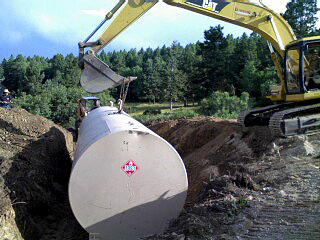 The Colorado FireBreak system is fully self-contained, including an isolated water tank and power sources. Depending upon the system chosen, it is activated either manually or automatically and relies on either electrical or gas power generation. The system is customized to your home and property’s environment, and to the area you want to protect. For the homeowner who wants a do-it-yourself fire retardant system, Colorado Firebreak recommends the FireIce Home Defense Unit. Using the same FireIce gel that our automated systems use, the Home Defense Unit is designed to deliver fire retardant through a powerful sprayer on wheels. It includes enough FireIce to cover a home up to 2,500 sq. ft. Additional buckets of FireIce may be purchased as needed. Environmentally friendly and non-toxic. It is safe for plants, wildlife, pets, and children. Non-corrosive and cleans up easily. Just rinse with water to wash it off. Long-lasting and effective. It does not break down over time and consistently outperforms the best Class A foams. FireIce is designed to protect structures in heat as high as 2000 degrees Fahrenheit. Give Colorado FireBreak a call at 720.216.2126 for pricing and to order your Home Defense Unit. Colorado FireBreak can show you how to use our automated systems. Using FireIce; the advanced hydro gel technology; combined with the customary FireWise home safety techniques will create the kind of defensible space that can save your home in a wildfire. Request a consultation from our team here. Ask your insurance agent about qualifying for special homeowner’s insurance discounts!